So I started the summer being obsessed with sox, sox, sox. And guess what... I ended the summer still obsessed with sox. For some reason this has just been where all of my crafty mojo has been interested. WannaME seems to think that I am going to ultimately get to a point where I can just reach in my drawer on any given day and toss on a pair of sox that I made myself. Yeah...at this rate that will never happen. As I said, this has been like the worst summah evah. It took like every ounce of everything I had to keep my sanity. 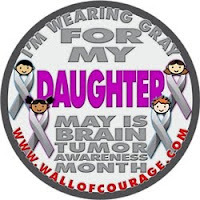 So in efforts to feel better I decided to pick up a project that I cast on way back in May. I was determined to have a FO. I NEEDED to have an FO! It took me approximately 3 months to finish 1 single pair. But finished they are. 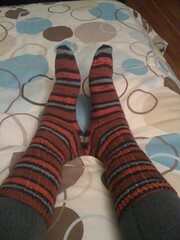 They are my red stripey happy happy joy joy sox! And I F'LUV EM!!! And just as I hoped it would, finishing my HHJJsox kick started my CraftyME juices. Immediately after those I cast on my Iris Ivy Anastasia Sox. A week in and I'm kicking arse on 'em. I'm already like half way down my big ol size 10 feet. And did you peep that, oh I'm fancy huh?!? Somebody is really feeling themselves and changing patterns up. Yeppers sure did! Took a single toe-up dpn pattern and made it 2-@-a-time. I told you CraftyME is coming back. I've even been crocheting. 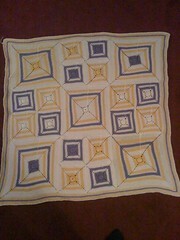 I made a cute little baby blanket for one Ms. Chloe who is due to make her debut next month. Mom-to-be wanted a very simple mostly white blanket. So I took the Circles, Stripes & Squares pattern and modified it to her tastes. OMG! 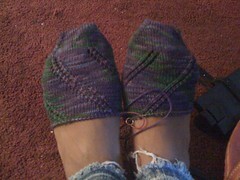 The Anastasia socks are EXACTLY wat I will do w/ my Candyland yarn! awesomeness! !